Cross-posted from the Conservation blog: Since OrvisNews.com launched more than a year ago, we’ve been beating the drum in the fight to stop Pebble Mine. For a full description of the project and the threats it poses to the last great run of wild salmon on the planet, visit the Orvis Bristol Bay information page, and then Take Action. This month, you’ll also have the opportunity to meet up with fellow Pebble opponents and learn more about the proposed mine’s effects on the people and wildlife of the region. 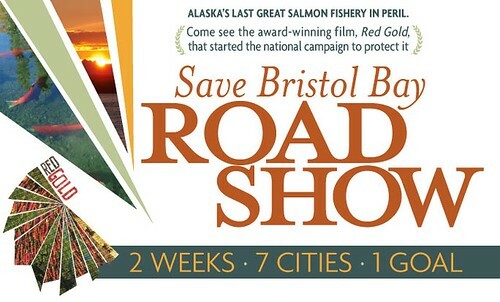 The Save Bristol Bay Road Show may be coming to a city near you. Alaska Natives, commercial fishermen, sportsmen, and seafood processors are heading south on the Save Bristol Bay Road Show to raise awareness and build support for protecting Bristol Bay, in southwestern Alaska, which is threatened by the proposed Pebble gold and copper mine. The mine, potentially three times as large as the largest current mine in North America, would threaten the headwaters of Bristol Bay, putting thousands of fishing jobs at risk, along with a Native way of life that has existed for centuries. But the real gold in Bristol Bay is the world’s largest sockeye salmon fishery, a sustainable resource that returns year after year. In six cities, commercial fishermen, Alaska Natives, sportsmen, and seafood processors will highlight the economic risks posed by the mine. The Road Show will also feature a screening of the award-winning documentary, Red Gold, delicious Bristol Bay sockeye prepared by local chefs, and locally produced beers. Melanie Brown, an Alaska Native and commercial fisherwoman, and Ben Blakey, of family-run seafood company, Snopac Products, will travel to all of the cities as featured speakers, sharing the importance of the region as an economic engine, source of jobs, and resource for food. In each city, the program will also feature sportsmen, fishing guides, or commercial fishermen, whose livelihoods depend on the clean waters and sustainable fish runs of Bristol Bay. More than 12,000 jobs depend on the commercial salmon fishery in Bristol Bay, along with more than 1,000 jobs related to sport fishing and countless other businesses. Seattle: Monday, October 17, Leif Erikson Lodge, 7 p.m.
Portland: Wednesday, October 19, Bagdad Theater, 7 p.m.
Corvallis: Friday, October 21, The Arts Center, 7 p.m.
San Francisco: Monday, October 24, Temple Nightclub, 7 p.m.
Santa Fe: Tuesday, October 25, Center For Contemporary Arts Cinematheque, 7 p.m.
Denver: Thursday, October 27, Oriental Theater, 7 p.m. The Save Bristol Bay Road Show is coordinated by the Save Bristol Bay campaign, part of a broad, bipartisan, national coalition that supports protecting Bristol Bay and its natural resources from the severe risks of massive-scale development, including the Pebble Mine. The Road Show is sponsored by the generous support of companies including Orvis, Sage, ExOfficio,Tiffany & Co., Icicle Seafoods, and Chef’s Collaborative.